Silver Reflective Piping For Better Night Time Visibility. 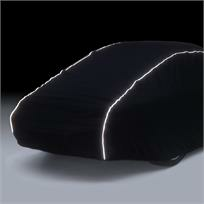 Storing your vehicle on a road or in a dark drive way and need some indication as to where it is? Running up and over the length of the vehicle from bonnet to boot, this piping reflects ambient lighting making it easier for approaching traffic to spot your vehicle in the dark. Please note: This option must be selected at the time of purchasing your cover. This cannot be added to an existing cover.